This bracelet unwinds into a long length of paracord. Paracord is a nylon parachute cord made up of bundles -- usually seven -- of thinner, twisted nylon cords wrapped inside a woven nylon casing. The cord is very tough and can be taken apart to provide cords for use in nets, laces and other camping or survival items. Paracord is available in bundles or pre-woven into products such as “survival bracelets.” It’s also used as decorative wrapping on handles and other items. Paracord shrinks when it gets wet; preshrinking it prevents nets, tie-downs, wrappings and other products from warping. Measure the length of paracord that you need and add 1/4 to 1/2 inch per foot. 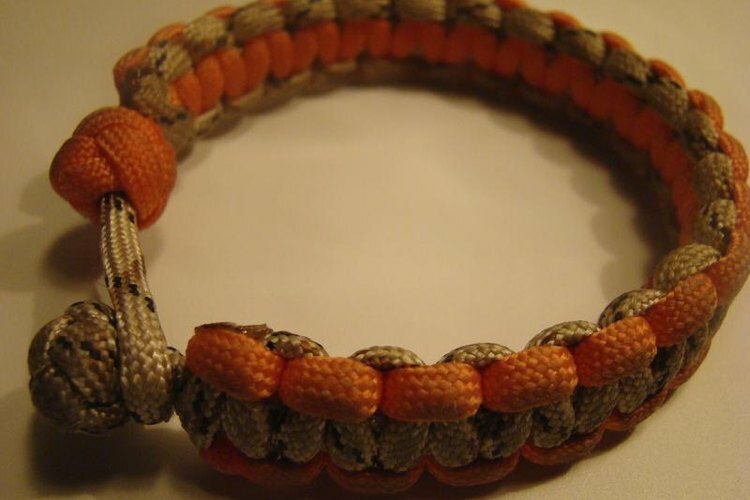 Paracord will shrink at a rate less than an inch per foot after you get it wet the first time. You might even want to test your batch of paracord by cutting a spare one-foot length and shrinking that first to see by how much it will shrink. Cut the lengths off the main spool, if you’re shrinking plain paracord. If you’re trying to shrink a survival bracelet or other woven paracord product, skip this step. Do not take the bracelet or other product apart. Fill a pan with warm water, or boil water in the pan. Use enough water to easily cover the amount of paracord you want to shrink. Drop the paracord into the water. Wait about 15 seconds if using boiling water, or wait five minutes if using warm water. Remove the paracord. Use tongs if the water is boiling or is too warm to comfortably touch. Place the cord on some clean, dry toweling or a cloth. Let the paracord air-dry fully. Once you shrink a length of paracord, it should not shrink again if you get it wet again. You can shrink very long lengths of paracord if you need to, but be aware that the shrinkage will seem much greater. For example, ParacordStore.com reported that a 10-foot length of paracord boiled for 15 seconds shrank to 9 feet 6 inches, which is a little more than 1/2 inch of shrinkage per foot. Once you know how much your batch of paracord will shrink, remember to add that amount to the length before cutting. For example, if you want a finished length that's one foot long, and your test shows the cord will shrink by 1/4 inch per foot, you'll need to cut a length that's one foot plus 1/4 inch long before shrinking it. Ultimate Survival Tips: Why Is Paracord So Important & How Can It Save Your Life?